A good way to tell your girlfriend that she is fat! 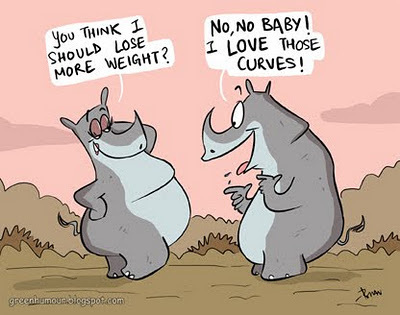 Rhinos are herbivores, spending most of their time browsing through grasslands for shoots and grasses to eat. In terms of its diet, the rhino is not very fussy and is known to eat a wide variety of vegetation. The Indian Rjhino favours wetlands and love to spend time in the water where it frequently feeds on aquatic vegetation. Rhinos drink several times a day when water is readily available, but can survive for days without water; on the moisture in the plant matter they consume.